Needless to say, this clip blew me away - MONSTER tone! So ever since I've been researching Sunn and trying to learn as much as I can about the LW rig on "Flowers of Evil". I understand he was using a Sunn Coliseum PA head, this interview here is a bit confusing http://webcache.googleusercontent.com/search?q=cache:PiIQXfRtN1cJ:www.richbriere.com/Sunn_Shack_2.htm+Sunn+Colosseum+PA&cd=1&hl=en&ct=clnk&gl=ca&client=firefox-a because it indicates the same name was used for a tube amp as well as solid state? Also the early tube heads were 4- KT88's, then later 6550's - no word on which setup LW used. I was wondering if anyone here could clarify that. Also, I'd be interested if you ever hear of a Coliseum coming up for sale. I bet that Les Paul Jr. sounds mint! In this interview Leslie talks about Sunn gear. If you watch this clip from 1970, you will see what Leslie is using. I believe they are Sunn 100S heads. So if the clip you posted is from 1971 my guess is that he was getting that sound with Sunn 100S heads. I did get this reply from a Sunn collector - "All of the early SUNN amps used KT88's except for the Mark IV which used EL34's. Conrad had to go to 6550's late in 1968 when the Genalex KT88's went out of production. LW was using the SUNN amps powered with KT88's. The Coliseum PA was a tube head with the power section of a 1000S and the preamp section of the Studio PA head. If you want the LW sound then running thru either three Studio PA heads or three Coliseum PA heads simply dimed thru a combination of 2X15 and 4X12 cabs. In other words the only way to achieve this sound is by playing at extreme volumes and pushing the amps and speakers to their limits." That makes sense. Trouble is, I'm never going to be able to try that. So other than dialing down the treble, can anyone suggest other tone tricks that can get closer to LW with a Plexi head/Marshall cab rig? I just can't let this go un-challenged. Attenuators are the single worst thing to ever be done to tube amps. Dunno about transistor amps, but tube amps need a dynamic load, not the static load provided by most attenuators. There is a very simple way to creat all the full bore power amp distortion which on emight want at less than ear bleed volumes. I have the circuit, but will not post it, or even a very detailed description of it on any forum that I go to. All that needs saying is that most amps were designed to play clean, and the guys who designed them had no idea that folks would want the tone which could only be gotten by pushing the amp almost to the point of falling apart or blowing up. But...there is a way ot make it happen, and it aint very hard to figure out. If I can see it, any half competent amp tech should be able to figure it out. It's not really a secret, people have been attenuating the input voltage to saturate the output tubes on amps at lower SPL for years. 40 years ago Ed Vanhalen was using a Variac to get his now signature "brown sound" by simply pulling back the AC voltage going in. Not the best solution as it lowers circuit voltages across the board, including the heaters. Over use can cause cathode stripping and other less than optimal situations, but a Variac will work for a mild AC attenuation. A better solution is London Power's "Power Scaling", which will safely pull back the current down to zero; in fact many amp builders who license the technology from London Power actually don't use a standby switch, you just turn the power scaling down to zero. As I said there are manufacturers who license the technology, but there are kits available direct from London Power that can be retrofitted to an existing amp. The only drawback is that there is an upper limit to how big of an amp it will work on. Theoretically it will work on any size amp, but the excess current is dissipated as heat so it become "less practical" above 100 watts or so. London Amps power scaling is ONE answer. It works, and is problematical for the reasons you outlined. I found EVH's use of a variac to get the "brown sound" to be a rather lame thing. He got his own sound, fer sure, but at what cost? My solution can best be described as "treating the power amp and pre-amps as two seperate devices". So, without giveing away the whole show, if one treats the sections as seperate devices one can set the character of the output section to perform at any degree of "overdrive" or with a degree of distortion which can be controlled. The pre-amp section can be pretty much "off the shelf" and use what most would call a "pre-phase-inverter master volume" to control the volume going into the power section as well as the amount of pre-amp overdrive. But that is all gross over simplification. How does that get the power tube saturation we've been discussing though? What have you designed that is superior to Kevin O'Connor's London Power's circuit, and more importantly why isn't it on the market? London Power is doing pretty good fiscally as far as I know, why not scoop up some of his builders with your superior "solution"? I'm not asking for technical specifics, just wondering theory you are putting forward about attaining adjustable power tube saturation without starving the components that need the juice. I believe that I included the master volume control for the pre-amp...that would determine the overall volume at output, but not the "character" of the output. It would be hard to go into further detail without giving away the whole idea, but if you figure it out, it's stupid simple. As to why it is not on the market yet, I just finished a prototype build, and it works as designed. I have not got it to market yet, but should have it in presentable condition within six months. MY design does not rely on starving any components, nor does it require a massive heat sink, and will work on amps up to 200 watss (so far). I will have to build a 300 watt prototype to be confident that it will work as advertised on the 300 watter. Thing is, there is no real "product" to sell apart from the line of amps I am planning. The concept is simple, and requires no parts or circuits not available "off the shelf" from any number of suppliers. In fact, this thread is the very first time I have actively discussed this idea with anyone not in my immediate family. And she just listens and smiles...she is a good wife. So...when I announce the fist issues of my amp I will post it here, along with sound clips and all that. Everyone talks about the Sunn Coliseum Rig that Leslie used, but to get the sound of the Live recording on Flowers of Evil, Leslie went with what Jimi Hendrix was trying to achieve when he had the same dilemma as West did when using just the straight Sunn Coliseum setup. Sounds confusing, but to clear this up, when i saw the Jimi Hendrix Experience in 1968, Hendrix used a combination of Fender Dual Showman heads and bottoms along with the Sunn Coliseum and then Marshall. It sounded drop dead KILLER!!! Looked like he was happy with that setup till Jim Marshall set him up to use Marshall exclusively. Sunn was already pissed at Jimi for always having to repair their equipment, this is why the Sunn line was dropped from 14 months instead of the signed 3 year original contract. Mountain received all of the Experience's equipment. For some strange reason, Fender didn't even endorse Jimi, and he was playing a STRAT!!! Leslie has made it public that the 100% Sunn Coliseum fell short of overall performance---"Great for Leads, but muddy for Chords". This is when he reverted to the 68' Hendrix setup. Here is the Live Flowers of Evil setup--1. 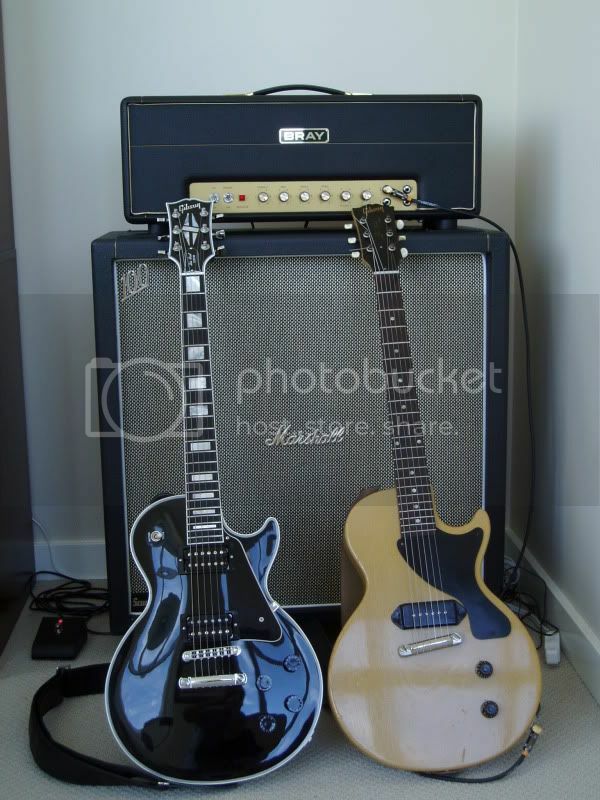 50watt Marshall w/1.Dumble Marshall bottom w/8 10'' greenbacks. #2. Sunn Coliseum P.A. head w/one 4x12'' Eminence Speakers bottom. #3 Fender Twin Reverb w/2-12''Altec Lansings. This move to this rig is roughly around late 1970/early 1971. I saw Mountain at the Eastown Theatre (Detroit) right after the Flowers of Evil album was out and they were touring to promote it. This is the same Rig he used at the Eastown. I always sat in the balcony with Military Field binoculars!!! If you listen to that album/cd, that sound that West achieved still holds water!!! Those Thunderous Chords are a direct result of the mating of those 3 amps/speakers together. I hope this clears things up a bit. Leslie then went to Jimi's other setup--100% Full Tilt Marshall. At the Cinderella Ballroom(Detroit), with West Bruce & Laing, West used 3 Full Marshall Stacks, while Jack Bruce(R.I.P.) used 2 full Marshall Stacks. Then it was at the Masonic Temple(Detroit) that the Wild 'West' Show started using Stramp amps out of Germany. Leslie used 3 Full stacks in Red Tolex/ Stramps. He was sponsored by Stramp with a Leslie West line, but that didn't last long because those amps were SUPER EXPENSIVE in 74-75. I know this personally because i went the next day to inquire about those unknown amps at Joe Massiminoes(Detroit) and Joe said ..."ARE you Crazy!!! Those Stramps have to be imported from Germany and they are 2-1/2 times the cost of a Marshall 71' plexi / plus shipping!!! You think that Sunn Coliseum P.A. is a rare amp? Try finding a 100watt Stramp or even a 200watt!!! Another interesting Note--haha, Leslie used LaBella flat wound strings for a very long time--an old New York company for many years. Picks were always thin, not heavy, for the attack. Well...hope that clears things up kiddies---Later. P.S. Oh, by the way, None of this is internet Romper Room speculation--i was at almost every concert Leslie West /Mountain ever performed at in the Detroit area in the past 44 years.